I used to love the Nirvana song Heart-Shaped Box. When I was suffering my first ever proper crush on a boy, I listened to it over and over again on my little tape cassette recorder. That and Alanis Morisette’s Jagged Little Pill. Completely random and irrelevant piece of information for you there, but if anyone wants to listen to a bit of Nirvana for Valentine’s Day (day after if you’re on email), I have embedded the video below. 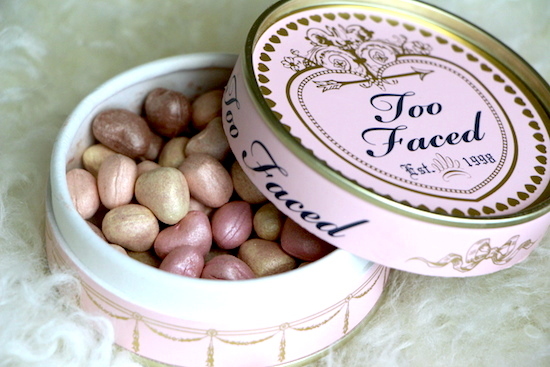 Anyway, back to beauty: these lovely blushers from Too Faced are each housed in a – you’ve guessed it! – HEART SHAPED BOX! 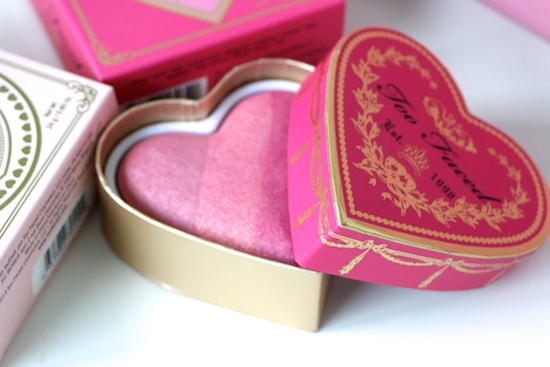 I find packaging like this quite irresistible, it’s just perfect dressing table fodder. The boxes are useless for taking out and about – the lids get loose and fall off, the powder gets bashed about, there are no mirrors in the lids – but for keeping at home and using with a big, fluffy brush? Glorious. And a heck of a lot easier to use. 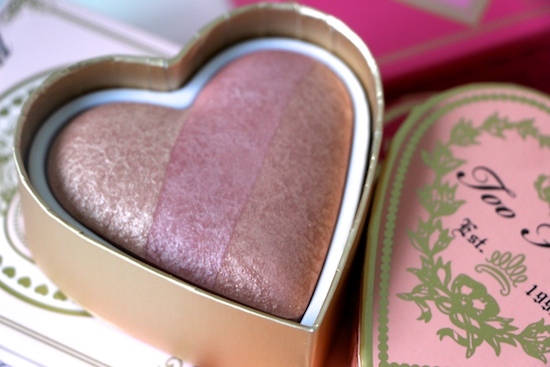 The blush isn’t actually anywhere near as shimmery as you’d think it would be at first glance. The baked finish gives an extra smoothness to the surface of the product that makes it look a little more “glowy” than it is in real life. Saying that, if you absolutely abhor any kind of shimmer then stay clear, it’s definitely not a matte blush. The Candy Glow version is reduced to £20.40 from £24 at the moment – have a look on Beautybay.com if you’re in the mood for some girly makeup indulgence… Debenhams has both shades available at £24 here. Previous Post Mad Pets, Lots of Shoes and my Oasis Spotty Blouse.